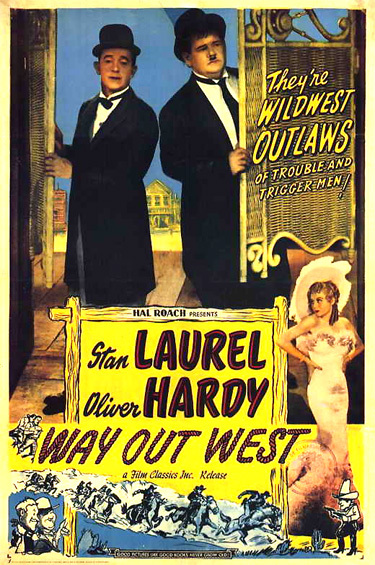 Way Out West (1937) is one of the best Laurel and Hardy comedy films, their only western spoof. Again, they reprise their most familiar roles - Stanley, the thin, meek simpleton, and Ollie, the fat, pompous one. The title of the film was a slight spoof of D.W. Griffith's similarly-titled silent romantic drama Way Down East (1920) with Lillian Gish. Aside from their classic Sons of the Desert (1933), Laurel and Hardy appeared in many films, notably The Flying Deuces (1939), A Chump At Oxford (1940), and the comedy short The Music Box (1932). This film was nominated for the Best Score Academy Award. Brushwood Gulch is a wild western town. At Mickey Finn's Palace, the boisterous saloon of the town, a serio-comic entertainer/dancer Lola Marcel (Sharon Lynne) "The Singing Nightingale, direct from San Francisco" is billed as the entertainment for the restless patrons. Mickey Finn (James Finlayson) [Note: A Mickey Finn, or Mickey, is a drug-spiked alcoholic drink given to someone without their knowledge], the larcenous saloon-keeper, is married to the equally greedy, brassy blonde showgirl Lola: "Say, if we ever get enough money together, we'll get out of this one-horse tank." Lola spices up the drinking establishment by singing flirtatiously: "Will You Be My Lovey Dovey?" and then dancing in front of her dance troupe. Stanley (Stan Laurel) and Ollie (Oliver Hardy), with their faithful mule Dinah, are on their way to Brushwood Gulch. Ollie relaxes on a sled pulled by the mule while Stanley guides the mule. When the animal proceeds to cross a shallow creek, Ollie is separated and left lying on the sled in the water. He almost drowns when he steps and drops into a large pothole and is swallowed up by the unseen hole. In the next scene, Ollie is wrapped in a blanket and riding on the sled - on which he has constructed a make-shift line to dry his clothes. A lot of weather we've been having lately...It's only four months to Christmas. Do you believe in Santa Claus? Sheriff: Fiddlin' huh? Well, we don't like your kind around these parts. And there's one thing we don't allow. And that's messin' with our women. Now, if you want to stay healthy, you better catch the next coach out of town. Ollie: (While tie-twiddling) Why yes sir. We'd be glad to, just as soon as we've finished with our business. Sheriff: And if you miss the next coach, (he draws his gun) you'll be riding out of here in a hearse. Outside the Mickey Finn Palace Saloon, they are transported into an eccentric, but cute and charming soft-shoe dance routine to the 1905 hit tune: "At the Ball, That's All," sung by cowboys (the Avalon Boys Quartet). It is one of the most lyrical moments on film. Finn (deceitfully): Oh, I'm Miss Roberts' guardian. What do you want to see her for? Ollie: Why, we have some very important news for her. Finn: Oh? What's it about? Ollie: Well, I'm sorry sir, but we're not supposed to discuss that with anyone but her. Stan: Yeah, you see, it's private. Her father died and left her a gold mine and we're not supposed to tell anybody but her. You see, didn't we Ollie? Ollie (glaring at Stan): Now that he's taken you into our confidence, (he slaps him on the shoulder) you might as well know the rest. Lola: Tell me, tell me about my dear, dear Daddy. Is it true that he's dead? Stan: Well we hope he is. They buried him. Lola: Oh it can't be. What did he die of? Stan: I think he died of a Tuesday. Or was it Wednesday? (turning to Ollie) Do you remember? Now that you've got the mine, I'll bet you'll be a swell gold digger. Down in the bar, Finn serves them "the best in the house" (champagne) and they join a cowboy to sing: "Trail of the Lonesome Pine." Mary is tricked into signing away her rights to the deed, thinking that she is signing other legal papers. Mary: That's Lola Marcel. Mr. Finn's wife. She's my legal guardian now. Stan: I think we've given that deed to the wrong woman. That's the first mistake we've made since that guy sold us the Brooklyn Bridge. Oliver: Buying that bridge was no mistake. That's gonna be worth a lot of money to us someday. Stan: We'll get that deed or I'll eat your hat. Ollie: (Shaking his hand) That's what I call determination. Sheriff (grimly): I thought I told you two dudes to catch the next coach out of town. Sheriff: Well, it left ten minutes ago. They are pursued by gun-fire as they flee the town, creating a swirling dusty cloud that follows behind them. In minutes, they are back at the creek, where disaster-prone Ollie disappears again into the same watery pothole.